Designed especially for compact homes, but indisputably adorable in any sized space, this cute wall mounted fireplace makes the most of every corner, every inch. 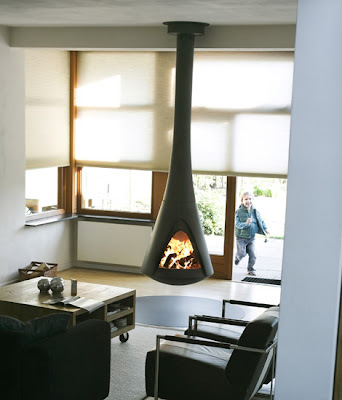 The Miofocus by Focus is a wood burning fireplace design that offers a traditional ambience with modern flair. This contemporary compact fireplace is a simple, unadorned design of 2.5mm steel which mounts to the wall, freeing up valuable floor space. A smoke outlet exits at the rear, so you don’t have to worry about unsightly fixtures and elements spoiling your decor. All you see is what’s meant to be seen – a roaring fire. The look is clean, clutter-free and contemporary, making an ideal addition to minimalist living rooms, earthy dens and cozy bedrooms. 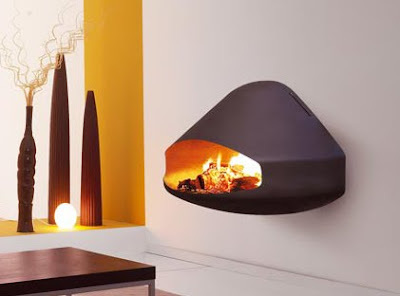 Check out this modern wall mounted fireplace at Miofocus. 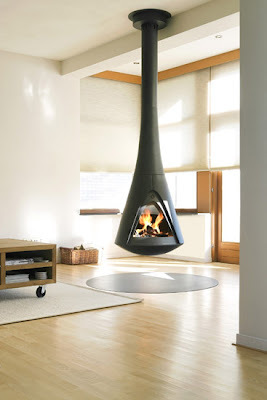 Tis the season to crank up the heat and the style in your home, with these amazing hanging stoves by Harrie Leenders. The Pharos Interior rotating stove is the latest and greatest from this Netherlands-based company. 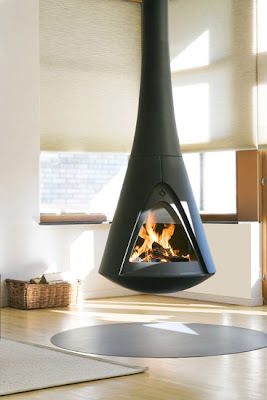 This open fire stove boasts a modern yet traditional shape that’s fixed to the ceiling, making a stylish statement in the living room, dining room, bedroom or den. A built-in spark screen puts safety first, but style isn’t far behind! This elegant open fire stove is available as a fixed, 60° or 360° rotating design, so you can enjoy an open flame from every angle. The stove pipe length can be customized to suit your ceiling height, so whether your home has cozy low ceilings or grand tall ones, this hanging stove is the perfect fit. Check out these cool rotating stoves at Harrie Leenders. 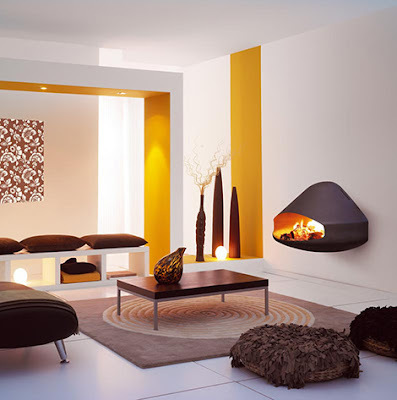 The designs for both the fireplace and hanging stove strike a fine balance between rustic and modern. They can be placed on any type of theme for your interior spaces and will adapt to its surroundings. However, the stove appears to strive as a centerpiece for any room, which may cause certain problems with the design of a room. Nonetheless, they do look fabulous. They are gorgeous, I agree it may be a difficult design issue, if the room is large enough to handle it, it would be great to work with circular funiture and making it a focus in the room.